Earn 15% and MORE as a referral fee for referred sales of UTeezSF products! The more you sell, the more you make with the referral volume bonuses. Check out the seller incentives of the Zazzle Volume Bonus Program. Set up a Zazzle account here! Click on the MyAccount link at the top of the page. Select the tab entitled Associate. At the top of the page, you will see your 18 digit Associate ID number in bold lettering. Copy and paste that Associate ID for safekeeping as you will use it to affiliate our products and to track your sales in your Zazzle account. When linking to Zazzle pages add your Associate ID to the link to earn referrals on purchases made by anyone clicking your link. For example, here is what a link to a Zazzle store would look like with your ID. You can replace AnyStoreName with any of your own stores. Be sure to add “?rf=” before your ID (unless the URL address already contains a “?”, then add “&rf=” instead). How long does my referral cookie last? Any customer that comes to purchase our products within 45 days of clicking your referral link will have the sale attributed to you. Please note: If the customer clicks a new referral link the sale will go to the most recent referral. Linking to UTeezSF products is easy! We’ve provided you with a selection of banner links and text links that you can use on your website(s), in emails. blogs, and in social networks. Simply copy and paste your 18 digit Associate ID in place of (xxxxxxxxxxxxxxxxxx); then copy and paste the code provided and start earning referral fees. It’s Just that easy. What is the user trying to accomplish by visiting my site? What do they do when viewing a particular page? How can I integrate ads into this area without getting in the users’ way? How can I keep the page looking clean, uncluttered and inviting? Certain locations tend to be more successful than others. 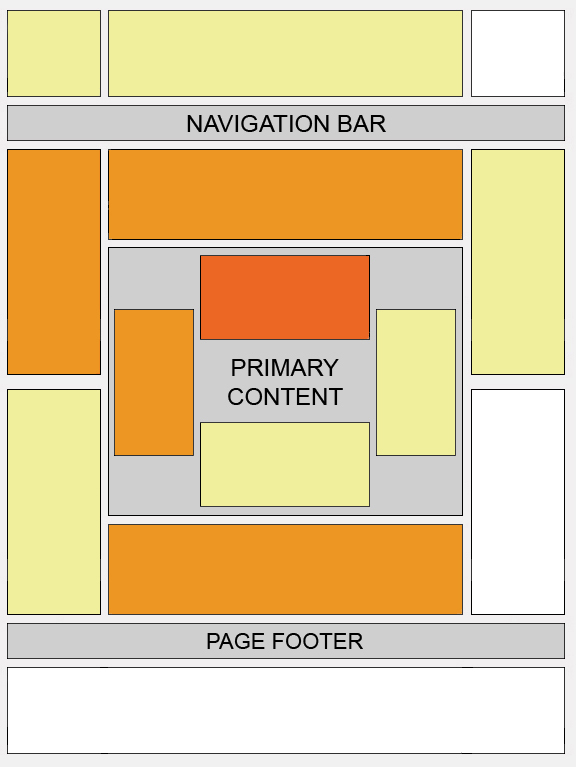 This “heat map” illustrates the ideal placing on a sample page layout. The colors fade from dark orange (strongest performance) to light yellow (weakest performance). All other things being equal, ads located above the fold tend to perform better than those below the fold. Ads placed near rich content and navigational aids usually do well because users are focused on those areas of a page.While this heat map is useful as a positioning guideline, we strongly recommend putting your users first when deciding on ad location. Think about their behavior on different pages, and what will be most useful and visible to them. You’ll find that the most optimal ad position isn’t always what you expect on certain pages. For example, on pages where users are typically focused on reading an article, ads placed directly below the end of the editorial content tend to perform very well. It’s almost as if users finish reading and ask themselves, “What can I do next?” Precisely targeted ads can answer that question for them. When you run a forum site, ad placement and formats are key to designing ads that will be successful but not intrusive to your regular users. Because forum regulars tend to skip the header and go straight to the meat of the thread, placing your ad unit above or below the first post can be more effective than ads next to the logo. Place a leaderboard immediately after the last post. This provides users who make it to the end of a thread with a ‘next step’ when the content ends. Try to avoid placing it after the footer, though, as your readers will likely move to the next thread without seeing the ad. Formats: Adapting your design for multiple ad units and limited space. Using multiple ad units, you can use a variety of formats to fill ad space throughout your site. Placing a skyscraper above the fold on the left side of your forum seems to produce slightly better performance than other positioning. However, when using multiple ad units throughout the page our horizontal bias still favors the leaderboard. Our heat map provides more details. Use horizontal link units, which are small enough to fit near the top of your forum just below the header. For the regular forum visitor, link units offer a wider range of relevant topics to browse. However you choose to implement your ads, keep in mind that forums are highly interactive sites with regular users. Be sure to blend the ads nicely, so they don’t appear overly intrusive – but don’t blend them so well they mislead your users! Every forum site is different and you know your community best, so as always use your own judgment to create the most positive experience for your users. To increase the likelihood that your readers will see and click on your ads, blend your ad units into the background of your blog. Choose a bold color for the ad title to help draw attention to your ads, then make sure that the background and borders of your ads are the same color as the background of the area where the ad is placed.